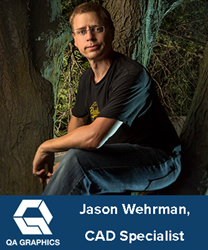 QA Graphics is proud to announce the hiring of Jason Wehrman, as a CAD Specialist. Jason will be part of the Drafting team providing design support for computer-aid design projects including floor plan development, as well as updating and polishing existing floor plans. He will also keep up-to-date on all the latest software releases and provide support as needed. Prior to joining the QA Graphics team, Jason has worked at Rohrbach Associates PC in Iowa City as a Drafter, CAD Manager, and IT. He has also worked as a 3D Graphics at Delawie Architects in San Diego, CA. In addition, he is also the owner of Lower Left Side Photography in Ankeny. Jason attended Northwest Technical Institute, where he earned his Associates in Architectural Drafting. QA Graphics is excited to welcome Jason to the team!